The waterfront Chateau de la Napoule is a non-profit arts foundation in Mandelieu la Napoule on the Cote d Azur in Provence, France in Europe. 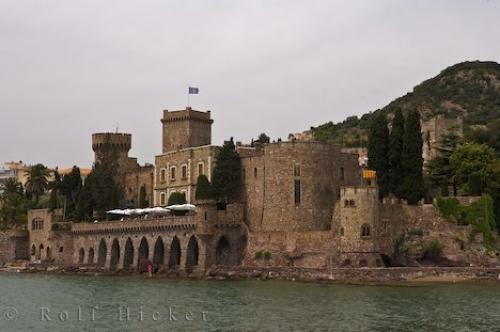 Photo of Chateau de la Napoule on the Cote d'Azur waterfront in Provence, France in Europe. ... Concerts, plays and other events are held annually at the Chateau as well as temporary art exhibits.Chateau de la Napoule in the town of La Napoule, The Riviera, Cote d'Azur, Provence, France, Europe. I photographed this photo with the digital SLR camera model Canon EOS-1Ds Mark II, aperture of f/7.1, exposure time of 1/200 sec. on ISO 100, as always I used a original Canon Lens, the focus lenght for this picture was 62mm.